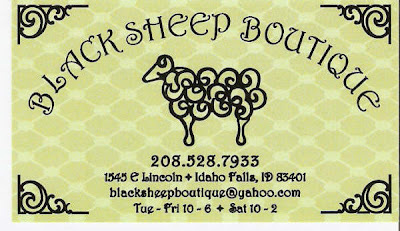 My Sister in law, Becky, and her sister Trisha opened a new store in Idaho Falls called The Black Sheep Botique. It is on the North Side of Lincoln just West of Woodruff (Across the street from Blacker's). It is one ADORABLE store. There is a lot of unique items in there that you will all love. They have some refurbished furniture that is really priced great, fun baby items, decorations, frames, vinyl, cute bags, etc. I would love for all of you to go and visit and just see for yourself! Plus...I would love for them to get as much business as possible. They even have a kids room that your kids can play in while you are shopping. I helped them set up the store-I even set up the window display!! It was a lot of fun! For my help, they gave me an apron that I was drooling over and it is so cute! However, I do not need a new apron. Instead of trading it in for something else, I am sacrificing my gift for the good of the store. I will give all of you until the end of Novemeber to go and visit the store, leave a comment on my blog about your favorite item in the store or something that you purchased while you were there and I will have a drawing at the end of the month for anyone that visited the store. YOU could be the lucky winner of the adorable apron! I can't wait to see what you all think! Happy Shopping! I don't need another apron, but I have to tell you that I LOVE a sign in there that is brown with white vinyl daisies and the words "Be Amazing." I also love their furniture...too cute! I loved the Be Amazing sign, too, but my most favorite was the little end table back by the bed AND the red and white polka dot chair. Cute store!